Physical release on CD and Cassette on 7/28/17. C31 – pink tape with black imprints. Pro-dubbed chrome plus cassette. 2-side 3-panel J-card with artwork by Max and KA. CD is packaged in a mini-LP jacket with artwork by Max and KA. 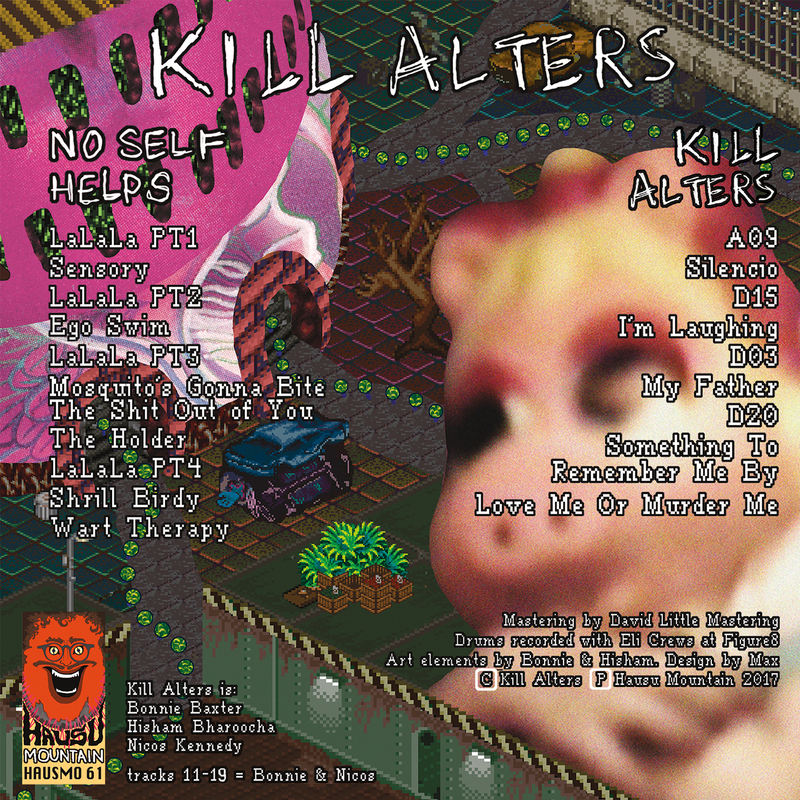 CD version includes Kill Alters’ 2015 self-titled debut as bonus material. The dense compositions of Brooklyn-based trio Kill Alters crash into you as a glorious mess of hyperactive vocal lines, pulsing electronic textures, and interwoven percussion patterns. No Self Helps, their first release on Hausu Mountain, speeds through a dizzying array of “noise”/”rock” anthems and found sound collage pieces that paint the band in all their idiosyncrasies as winking masters of transportive heavy music. Bonnie Baxter jumps at center stage with mic in hand, screeching, chanting, crooning, and otherwise pouring out her soul. As her wildly diverse vocal performances flit between moods and styles on a dime, she commands a choir of alternate personalities waiting to overtake each other for turns in the spotlight. Drummer Hisham Bharoocha, a veteran of the underground circuit as a member of groups like Black Dice, Lightning Bolt, and Boredoms‘ touring ensemble, provides Kill Alters’ pummeling rhythmic backbone. His manic tom rolls, tight kick drum grooves, and tumbling snare cascades interweave with programmed percussion and synth lines pumped from Baxter’s twin Electribe EMX drum machines. Nicos Kennedy drapes layers of squalling synth texture and disfigured noise into the mix from a hybrid arsenal of analog and digital machines, assuming the role of the wild card as much as the meticulous onstage producer. The composite electronic/acoustic rhythms of No Self Helps swerve in tandem between plodding industrial bursts and fractured funk workouts, stopping only to segue through recorded bits of Baxter’s past that pop up as collaged memories within the din. 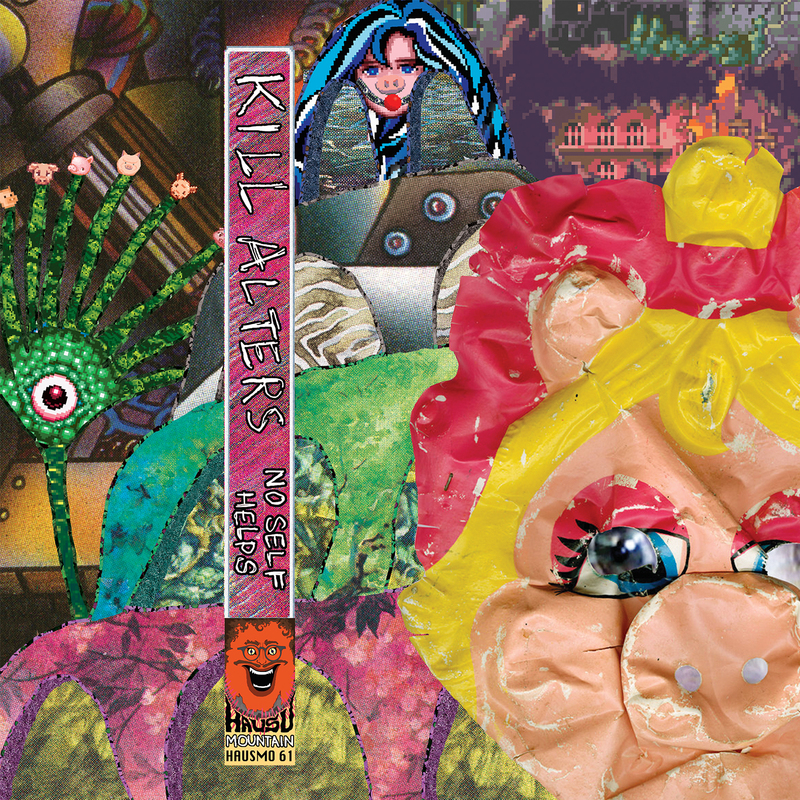 Far from the trope of the misanthropic noise band that takes their image dead seriously, Kill Alters brings a sense of humor and childlike play to counteract their massive sonics. The band splinters the program of No Self Helps into interludes of found tape audio that catch Baxter singing in chipmunk tones with her family as a young girl. 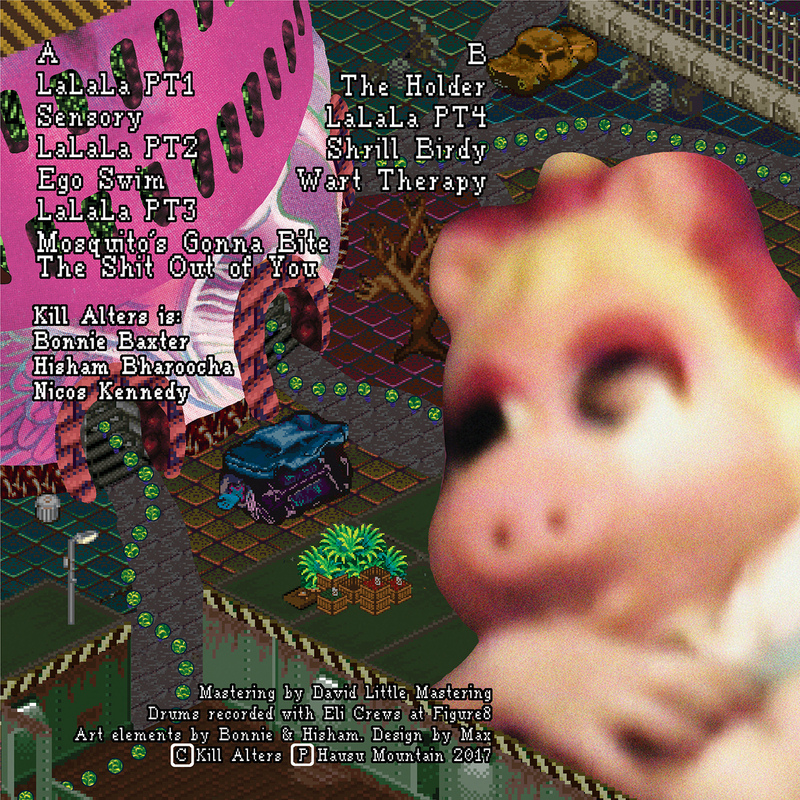 The album ends with Baxter in a therapy session with her mother, a skit that lands somewhere between diaristic personal history and bewildering physical comedy. These touches cut straight to the kind heart of the Kill Alters project, which serves as a vehicle on and off stage for the prevention of child abuse and the protection of the vulnerable and the marginalized. The band channels benevolent energy into fuel for ever deeper cathartic jams, and has made their mark in live performances with an NYC-and-beyond circle of like minded groups including Guerilla Toss, Deerhoof, Machine Girl, and Wolf Eyes. 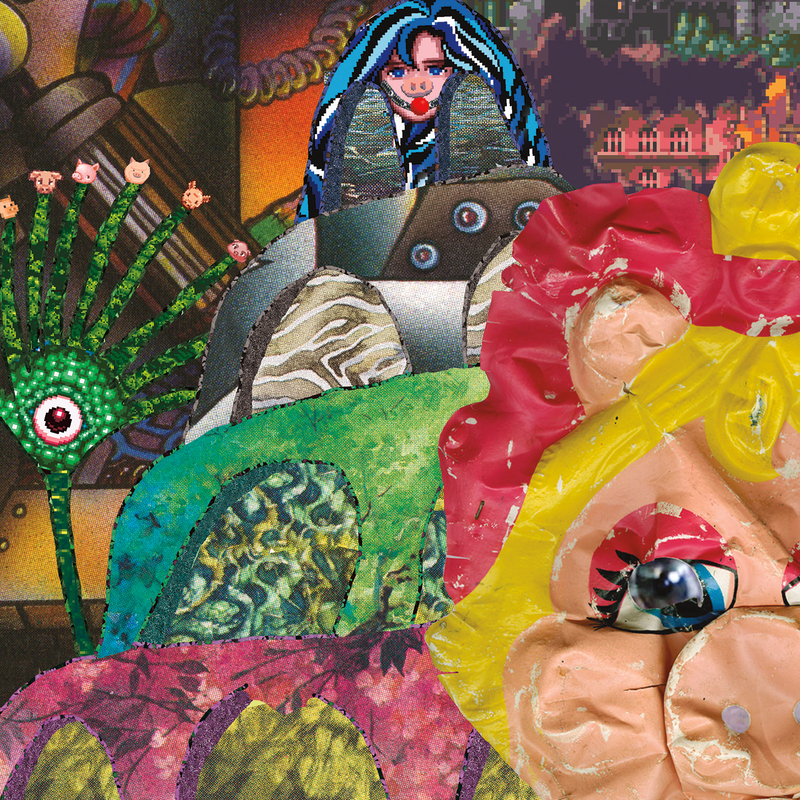 Like these projects, Kill Alters channels the peculiarities and specific skill sets of each member into a unique and detailed expression greater than the sum of its parts. More than simply playing into an established style or genre, Kill Alters seeks above all to bare themselves and share their experiences with others, harnessing some forms of noise, texture, rhythm, and storytelling as the only tools capable of doing so.